When it's too hot to cook and you have leftovers to use, let them eat cold plate. Guess I could come up with a more creative, nicer name than cold plate, but at least no one expects a hot meal with that name. From top to bottom, clockwise we had. 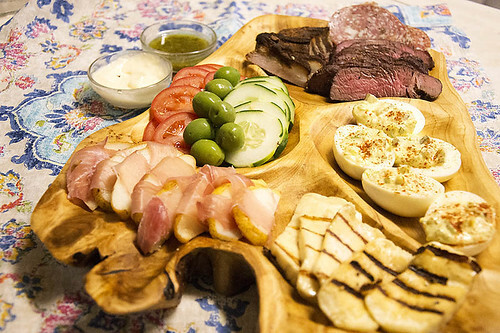 crispy pork belly salami, grilled top sirloin, deviled eggs, grilled halloumi cheese, pears wrapped in prosciutto, sliced tomatoes, castelvetrano olives, and sliced cucumbers. The dipping sauces are creamy horseradish and chimichurri. When I made the chimichurri sauce, I froze the extra in an ice cube tray then put the cubes in a plastic bag in the freezer, all I had to do was defrost a couple of cubes and I was good to go.